The purpose of this venture is to create a detailed topographic map of the entire state of Nevada at 24k detail. This map is created for Garmin GPS receivers and Mapsource/BaseCamp. Points of Interest - summits, mines, falls, dams, cemeteries, towers, populated places, etc. plus National Forest points. This map covers the entire state of Nevada. 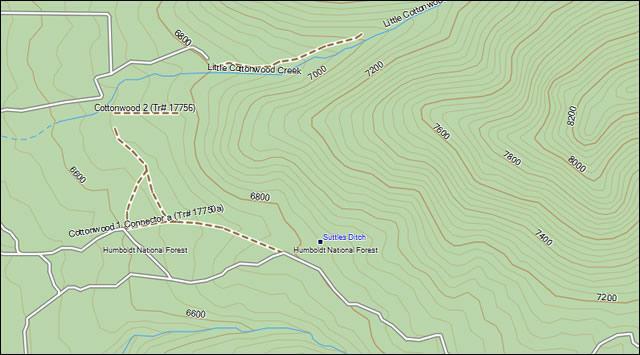 This screenshot compares the Nevada Topo (left) to Garmin US Topo (middle) to Garmin Topo 2008 (right). With the exception of the DEM shading you can see that the Nevada Topo is significantly more detailed. Two options exist; for windows download and run setup. The map will then appear in Garmin MapSource or Garmin BaseCamp and can be added to your GPS by selecting it in MapSource or BaseCamp and sending it to the GPSr. For Mac download the mac version, extract it and double click the .gmapi file. Map Manager will then install the map for you. This map can be installed with any other Garmin Maps (How-To Tutorial). Then you simply hide and show other maps until you see the Nevada Topo. For more detailed instructions check out this tutorial. Although this map is free, and always will be if you find the map useful please consider making a donation to offset software, hardware, and hosting costs. There is a donate button at the bottom of this page or on the download page.